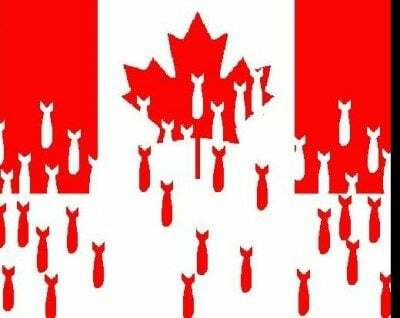 A registered “charity” with buckets of donations from arms manufacturers and other corporate sources is aggressively trying to push Canadian foreign policy further towards militarism and the use of violence. Since last month’s federal budget, senior CGAI analyst David Perry has been quoted throughout the media arguing for increased military spending. “I’m stunned this budget is actually taking money away from the military and pretending to give it back several decades in the future,” Perry told CBC. Watch Justin Trudeau’s interview with Huffpost Canada here. Beyond the media work most think tanks pursue, the institute expends considerable effort influencing news agencies. Since 2002 the institute has operated an annual military journalism course together with the University of Calgary’s Centre for Military and Strategic Studies. A dozen Canadian journalism students receive scholarships to the nine-day program, which includes a media-military theory component and visits to armed forces units. While it may not have succeeded in this instance, online criticism and complaints to journalists’ superiors do have an impact. If pursued consistently this type of “flack” drives journalists to avoid topics or be more cautious when covering an issue. While not exactly forthcoming about its funders, the institute has received some military backing. The Canadian Forces identified CGAI’s predecessor, the Canadian Defence and Foreign Affairs Institute, under the rubric of “defence-related organization and defence and foreign policy think tanks.” DND’s Security and Defence Forum provided funding to individuals who pursued a year-long internship with the Institute and CGAI has held numerous joint symposiums with DND, NATO and NORAD.